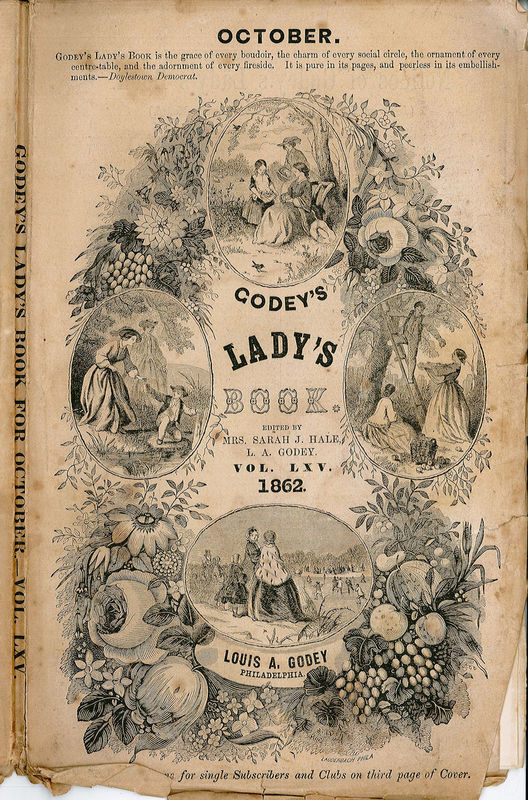 Godey’s Lady’s Book and Magazine, Vol. 64, June 1862. This engraved cover of Godey’s Lady’s Book contains oval vignettes of women and children occupied in a variety of outdoor pursuits. The four romanticized scenes, framed by a harvest of vegetables, fruits, and flowers, demonstrate appropriate gender roles for American women of the period. Each scene depicts two modestly dressed women wearing floor length dresses with full sleeves and skirts that reveal only their faces and hands. Their long hair—worn pulled back from the face or covered by a hat or bonnet—exemplifies a tasteful modesty and their posture exhibits calm nobility. Three of the scenes include young children, indicating a woman’s role as mother and educator. In the fourth, a young man reaches down from a ladder to deliver an apple into a waiting apron. Two of the children in other pictures make similar gestures; one offers a cup of fresh water dipped from a stream and the other an apron full of gathered flowers. The framework of the four seasons suggests a felicitous participation in a natural order, and the simple narratives indicate that a woman who embraced these models had full access to nature’s pleasures and bounty. In the early decades of the nineteenth century, American culture treated motherhood as a largely private affair removed from public discussion. However, by the 1850’s its role took pride of place in publications devoted to a female audience such as the widely read Godey’s Lady’s Book. This development reflected a new emphasis on a codified image of a “true woman” for whom raising children meant high esteem and self-satisfaction. Most women accepted the concept that a nurturing protective mother occupied a position at the center of a well ordered-society. The true woman embraced the qualities of piety, purity, and submissiveness to provide a healthy and secure domestic environment, free from the perils of the outside world. While the cover’s medallions offer scenes from the out-of-doors, they all represent essentially semi-private activities contained within a domesticated sphere. The home presented a school of emotional responses and morality that offered mainstream values and refined domestic ideals. Published from July 1830 to August 1898, Godey’s Magazine changed its name three times. 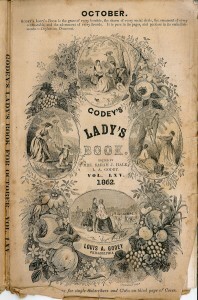 Originally titled The Lady’s Book, it subsequently became Godey’s Lady’s Book and Magazine (1854-1883), and ended as Godey’s Magazine (1892-1898). Specializing in sentimental fiction, poetry, and fashion trends, it also featured hand-colored engravings, advice in matters of etiquette and health, as well as sheet music. A highlight of each issue, the centrally located full spread engraving offered multiple dress designs for the coming season. The publication set a circulation record for an American women’s magazine, reaching 150,000 subscriptions in the late 1850s. Two individuals were central to the journal’s success. Louis Antoine Godey (1804-1878) served as editor until leaving the magazine in 1877. Sarah Josepha Hale became its literary editor in 1837. A proponent of women’s education, Hale authored the poem “Mary had a Little Lamb” and proposed the establishment of Thanksgiving as a national holiday. Both accomplishments reflected the qualities of mothering and pious domesticity. Hale left the same year as Godey, at the age of ninety. In print for sixty years, Godey’s Magazine presents a broad cultural study in sentimental domesticity. It celebrated the familial bonding between spouses, parents, and children. It provided women patterns, not only for embroidery and dressmaking; but also for concepts of family, gender, class, and an identity of the self as related to the domestic sphere. The Civil War hastened changes in the acceptability of roles for women outside the home, and the nurturing qualities associated with domesticity permitted transitions to employment in the public sphere as writers, teachers, and nurses. the cover was so epic. very great art!